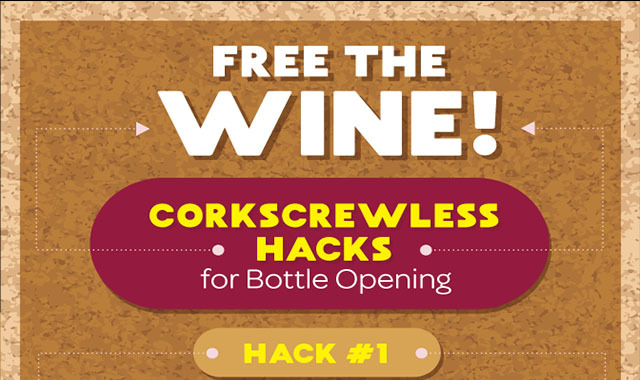 Corkscrew-less Hacks for Freeing Wine from the Bottle #infographic ~ Visualistan '+g+"
Nothing puts a cork in the night like having a bottle of wine and no corkscrew. It’s a nightmare for both hosts and guests alike! After all, when there’s cheese to be plated and pasta to be served, wine is an absolute must. It’s also the perfect beverage for winding down after a long day at work. Devoted wine drinkers might think: How can someone not own a corkscrew? It might seem shocking, but there are many situations that can leave you corkscrew-less. Maybe you’re on vacation and spontaneously bought a bottle. Or maybe you’re at a party hosted by someone who typically doesn’t drink wine at home. Or maybe you just moved into a new house and want to celebrate with a bottle of red, but can’t bother with unpacking.